What: Up to 60% off on men's and women's clothing and accessories. This sale usually gets cheaper as it progresses. What: Cuffs, rings and headpieces and more in brushed metals. Antique gold cuffs, gunmetal hair combs, crowns, and rose gold lace rings. Prices start as low as $30. Prices 70-80% off retail. 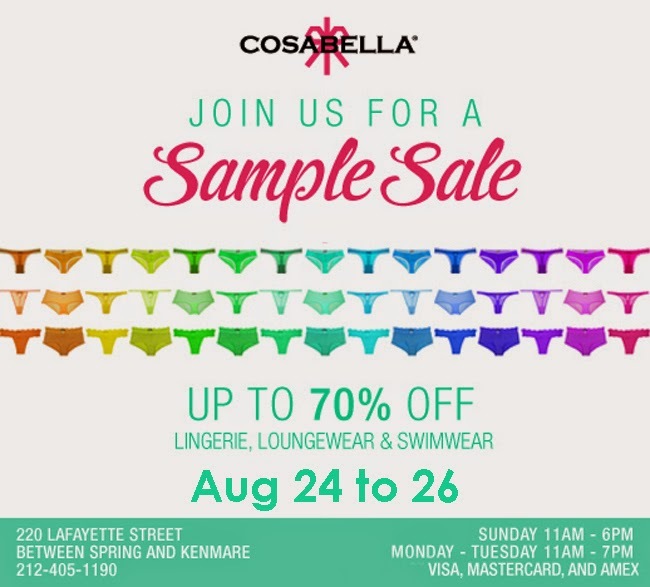 What: Up to 70% off lingerie, ready to wear, and swimwear. Prices will range from $13 to $80. Visa, MC, and Amex only. When: August 24-26, 2014. Sun 11am-6pm, Mon-Tues 11am-7pm. 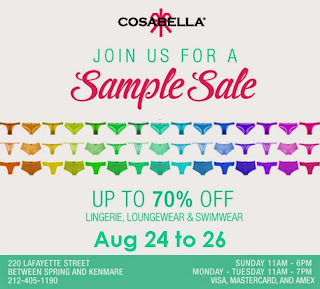 Where: Cosabella NY Flagship Store, 220 Lafayette St (b/n Spring and Kenmare St), 212-405-1190. What: Up to 80% off furniture and home goods. The Edge Rustic Dining Table is $1,599 (was $2995), the French Quarter Dining Chair is $159 (was $395), White Metal Gilded Console is $999 (was $1,295). Rugs are one size, one price, starting at $225. When: August 21-September 14, 2014. Mon-Sat 10am-7pm, Sun 11am-6pm.